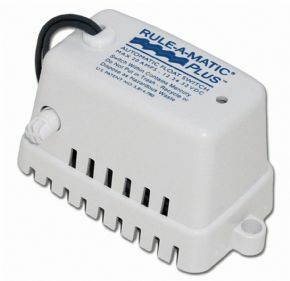 Representing the latest in innovation and design.Compact, sleek and rugged, the Rule-A-matic Plus Float Switch has a strong, fully integrated, impact resistant cover, which protects against debris and jamming. New highly abrasion resistant wires exit the top keeping them out of the water and keeping wear and tear to a minimum.Dual level anti-clog water slots provide a unique level of performance and protection. Manual testing feature allows an operation check. For use with pumps drawing up to 20 amps. Use with 12, 24, and 32V DC bilge pumps up to 20 amps max.